Hello all, it's a dreary day here at the moment, but I had a really good trip to Darlington over the weekend and, apart from a little rain, it was the perfect weather for wandering around the town on Friday afternoon. I am usually sat down designing, demonstrating, travelling.....so when the chance arises I like to really stretch my legs and I'll walk for hours. My legs could do with stretching that's for sure! So I travelled up to Darlington on Friday and, having had a discount voucher from the rail company, I had been able to get a first class return ticket for less than the normal "cattle class" price. So, nice and quiet, a couple of complementary coffees and more leg room....I could get used to it! It was really sunny when I arrived there and I dragged my bags to the hotel - uphill most of the way, but not that far. I was staying at the Bannatyne (owned by the dragonmeister, Duncan, himself) which is a lovely hotel with exceptionally friendly and helpful staff. My room wasn't quite ready so I left my bags and set off for an afternoon of walking and shopping....and searching for teeny things for the Shadow Box workshop this coming Saturday. I called in lots of charity shops without much success on the nick nacks front, though I did find a very inexpensive Blue Ray Disc for David to add to his collection. I managed to get a few things though - some coloured pebbles with words etched onto them, a stone heart and some nice marbles that put me in mind of fortune teller's crystal balls. I called into the market and discovered a cake decorating stall where I managed to get some really dinky crowns as well as a bag full of hearts, horseshoes, ballet dancers etc. So, not too bad really. A visit to Past Times forced me into another purchase, which, if you know about Cherry, our greatly missed white pussycat, you will understand. It was the dinkiest necklace with a teeny crystal cat and, the fact that it was in the sale was the deciding factor! I've taken it off the chain and am going to have it attached to my charm bracelet....been looking for a little Cherry charm so I'm really delighted with it. I spent about five hours wandering about so, once the feet started to complain, I went back to the hotel. I've stayed there before (not expensive if you book online) and last time I left some good comments for them on a travel review site...the manager contacted me and asked me to book through him next time I was planning on staying, which I did. Imagine my delight when I went to my room and found that he had upgraded me to a huuuge suite! It made for a really comfortable evening, though it was just a shame that David wasn't with me to enjoy it too! There was a large fruit bowl, magazines, chocolates and drinks to welcome me, a lovely snuggly bathrobe (no, I didn't pinch it!) and the comfiest sofas I've ever sat on. Just shows that it pays to say something nice when you get good service. As promised to the ladies at Darlington on Saturday - here's a piccie of just one part of the room! I had a great night's sleep and then, after breakfast, walked round to The Art Shop on Bondgate. If you don't know this store, it is excellent - really helpful staff (must be a Darlington thing!) and Ian and his team always look after me. The first arrival to my table was Beverley, who had emailed me previously to ask about my Fairy Doors which I brought for her to have closer look at. Beverley generously brought me some Maltesers, and, even more generously, a gorgeous canvas that she had made....you can see it resting against the choccies. Isn't it lovely? Thank you so much Beverley, I shall treasure it. I've also included a card and tag in the photo which Sheila kindly sent me a couple of weeks ago and the card on the right which was from Joanne just before Stitches. All of these were complete surprises which made them even more special...thank you ladies. Btw, I brought the Maltesers home, unopened, to share with David, as they are one of his favourites......needless to say, the box you can see there is empty! So David says thank you as well Beverley! There was a lovely surprise of a different kind too, when I looked up and saw Joanne and Terry (PegLeg) standing there.....a big surprise as they had been down in Newport Pagnall where Joanne had been attending the Tim Holtz workshops and, instead of going straight home they had come up to Darlington to see me. I was only sorry that I couldn't spend more time with them, but it was lovely to see them both. I had made two more Shadow boxes for my demonstration - here's a picture of the smaller one which I used the TH Vintage Shabby papers and Symphony Tissue Tape to cover. I didn't put quite so many things into this one and I included the acetate sheet at the front, but I quite liked the slightly less crammed look for this smaller sized box. This size would also make a great gift - a new baby box could include a little bootee, dummy, wrist band etc, or an anniversary box could have the hearts, anything made from the relevent year's material (silver, pearl, gold etc), numbers etc. They are a very gratifying project to make. I left this box at The Art Shop, so, if you missed my demonstration, do have a look if you pop into the shop. I have another box, but will save that picture till after this Saturday's workshop. Here's a picture of what turned out to be the most popular card that I made on Saturday. I used Adirondack Colourwash Dyes sprayed over PI 300 gsm card and spritzed with water. I then applied a second piece of card over the wet dye and heat set them both to get two different backgrounds for the price of one as it were! I chose this one for the card, as the depth of colour and the way they had spread was just what I wanted. I stamped the trees from Darkroom Door set DDRS018 Trees, using Archival black ink. I used a Le Plume black pen to add a simple base to "root" the trees to, fading it out a bit at the base so it looks a little as if the trees are on a river bank (use your imagination a bit!). I painted water in a circle to create the moon, dabbing off the excess water which lightens the colours. I trimmed the card and matted it onto black. I liked the way that some white areas of the card just add to the watercoloury effect. I stamped the bird from set DDRS057 Love Birds partly over the moon. The sentiment is from the Trees set and was stamped onto gloss card, torn round and edged with a touch of Tumbled Glass Distress ink. I took a large card blank (8"x8") and lightly spritzed with Colourwash dyes and water. The card looks a smidge warped because I would normally either iron it after dyeing, or flatten it under something heavy. As I made this on the day, I didn't get chance to do either, so please forgive the bending! As you can see, I have somehow managed to let some purple and blue creep back in! Must make one of these using some orangey tones for a sunrise/sunset look! I left this card in Darlington too, so do check it out if you are there. I'll finish with a few more images of some of my new stamp sets. The first two are Easter themed, one cute and one traditional. This first set is one of only a few outright cute sets that I've designed for the Spring release. 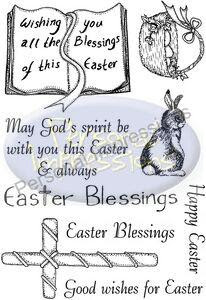 I'll post pictures of cards made using the Easter designs after the weekend. I made a new baby card at the show for my friend Elaine using the Cute Easter set. 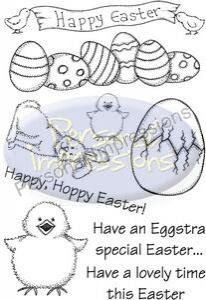 Elaine had just become a great auntie, so, with no baby stamps to hand, I used the large chick and the cracked egg (cut into two pieces) and added the words "newly hatched"! So, details of these are....Easter Cute PICSA6209 and Easter Tradititional PICSA6210. Both of these should be available next week from any PI stockist as the Easter and Mother's Day designs are being released first. 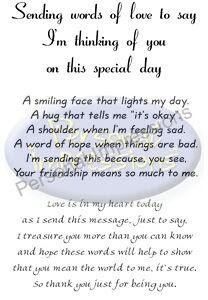 The next set is called "Sending Words of Love" PICSA6200 and is one of several verse sets that I have designed. This one should be available in about three weeks or so, as will the remainder of my new clear stamp sets. The verses are ideal for card inserts, but equally suitable for making a focal point on a card front. I watched you create that gorgeous tree card and it is just that - gorgeous. Glad you enjoyed this trip, everything was perfect this time and no 'nasties' on the train. Hope to pop to see you on Sunday. I so want some of those colour wash dyes! Looks like you had a very busy weekend! Wow, you are. Clever girl do you ever do any classes in the midlands? Thanks for such an inspiring demonstration on Saturday,I haven't stopped crafting since...apart from sleeping and eating! Love the trees card Lindsay, and all your new stamps. Thanks for the lovely newsy post, and great ideas.